Whether your business gets a new home or you’re upgrading your current place of work, you’ve got to keep costs under control, and that means finding a commercial electrician who’s on your side. The ones you can trust are those who are highly trained so that their work does the job of spreading positive reviews. A team of highly experienced professionals whose business relies on its good name is a safe bet. A handyman is riskier, on multiple fronts. He can give you an estimate but then make little mistakes in procuring materials or in calculating labor times that can impact costs, possibly bumping up the bill past what was agreed upon, just so he can finish the job. If you don’t like it, well, he can go do some other job. He has more options than areas of expertise. A company of commercial electricians, on the other hand, is committed to doing great electrical work. That’s a green flag. Even better yet, look for a company that’s not also an outlet for electrical equipment companies. Logic being, if a commercial electrician bases his living on the service he provides, Then the quality of his work has to be excellent. 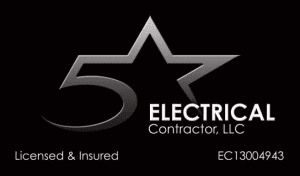 If you’re looking for a commercial electrician, we at 5 Star Electrical LLC are on call to ready to provide professional and friendly service at a fair price. Our areas of expertise include (but are not limited to) lighting installation, smart home systems, and panel upgrades. Give us a call.